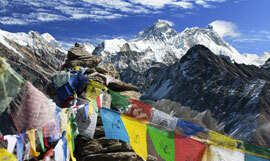 Distance 15 km, 6-7 hours, 610 m ascent, 410 m descent, camp altitude 3,130 m. The Trek starts near the village of Tabiting. 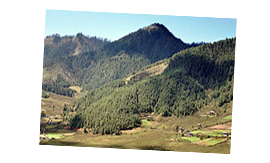 The trail winds through meadows and fields and the climb takes you through a mixed forest of juniper, bamboo, magnolia and rhododendron to Tsele La (3430m). From here you descend into the Juge Khankha Chhu valley. Further on, on oath leads to Gogona, well known for its Gogana Cheese production. The campsite is a bit further ion beside a small stream in a yak pasture called Zasa. Distance 16 km, 5-7 hours, 450 m ascent, 860 m descent, camp altitude 3,330 m. A gentle climb leads to Shobe La pass (3,480m). The descent from the pass leads to a wide valley, surrounded by beautiful mountain ranges. Below the route one can see Khothokha, a village with about 60 houses. You finally reach the campsite by climbing gently up till you see four chortens in a forest of blue pine.